President Reuven Rivlin hosted this morning, (Monday,) the regional and municipal heads of the Jewish communities in Judea and Samaria, including chairman of the Judea and Samaria Council, Avi Roeh. President Rivlin welcomed the delegation to his residence and spoke of the recent wave of terror attacks in Judea and Samaria. “This house is your house, the house of all the citizens of Israel," he began. "Over the past months, and especially over the last few days, the communities of Judea and Samaria have faced very serious terror attacks. And so especially at this time, this meeting is more crucial than ever." "As always, the pioneers go before the camp," he continued. "It is they who encounter the most opposition and pay, along with the soldiers of the Israel Defense Forces, the heaviest price." "The settlements are at the forefront of the struggle, and the price paid by the settlers, is a painful price indeed." 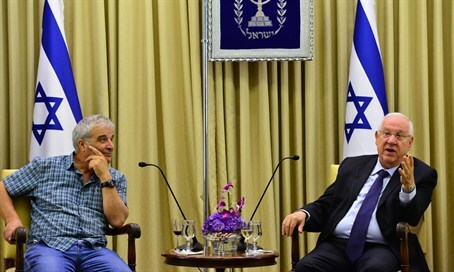 Rivlin then encouraged the IDF to continue its work protecting the people of Israel. "We must, and are able to, deal with the current wave of terrorism, to fight it, and not allow anyone to disrupt our daily lives," he said. "I see this decisiveness reflected in the recent determined and appropriate response of the soldiers of the IDF." "We must be an iron wall, a protective shield, against those who seek to rise up against us," he added. "At the same time, we must remember that our struggle is not a struggle for the sake of struggle." The President continued to note that settling in the land of Israel is the right of the Jewish people, and offered encouragement to the regional heads. “I love the land of Israel with all my heart," he said. "I have never and will never give up on this land." "For me, our right to this land is not a matter of political debate. It is a basic fact of modern Zionism," he continued. "We must not give anyone the sense that we are in any doubt about our right to our land." "For me, the settlement of the land of Israel is an expression of that right, our historical right, our national right, stemming from a love for the land of Israel, from a recognition of our roots, which come together here," Rivlin explained. "I have no doubt that it is clear to all of us, that in order to realize the ultimate goal of building the land of Israel, we must be sure to do so only with the use of the legal tools available to us." Rivlin then addressed the local regional council heads. "Regional heads, you are on the front line," he stated. "You deal with the daily needs of, and the daily contact with the residents. I invited you here today to hear from you, to hear from the settlement community, to hear of the needs, and to try and help wherever possible." Chairman of the Judea and Samaria Council, Avi Roeh, responded with a more detailed explanation of the situation in Judea and Samaria (Shomron). "We are certain of your key stance for the sake of the land of Israel, and for the Jewish state, out of a belief and faith in the State of Israel, together with the need to care for all the citizens," Roeh stated. "The issue of settlement is a challenging issue for the State of Israel, whether in the Golan, in the Negev, in the Galilee, or in Judea and Samaria." "We came here both to present before you the difficult situation in which we find ourselves," he urged. "In Judea and Samaria, more than four hundred thousand citizens of the State of Israel live, for whom the development and the prosperity of the State is our daily concern." "The building freeze and the halting of future planning in our communities, harms our very existence and our children's future," Roeh continued. "The freeze on development, and the halting of building public infrastructure, such as kindergartens and schools, is causing serious harm to the citizens and the children. Having known you for many years, I am sure and trust you to act on this issue." "In the run up to the new year, together with you, we want to send out a clear message from here, of unity and partnership for the people of Israel, across the diverse communities," he added.